The process for choosing one possible option for the future of the St. Johns Golf Club continued to inch forward this week. A committee formed to review the requests for proposal (RFP) solicited by the county met Thursday and identified a finalist for a potential project that would include a renovation of the public golf course. McGarvey Residential Communities was chosen as the finalist over Heritage Development Group. Both companies are local with successful residential projects in the county already. At the request of the County Commission, county staff sought RFPs from developers interested in buying approximately 80 acres of excess land around the course. The developer would be required to rebuild the 30-year-old course in exchange for the right to put homes on the property. The Golf Club was 27 holes, but nine holes were closed down in 2011 to save on maintenance costs as the amount of play on the course declined. That is how the excess land was created. McGarvey proposed two business plans. One includes setting aside space to serve as the permanent home of First Tee of North Florida. It also adds two new county parks, including four pickle ball courts, a tot lot playground, community garden, and multi-purpose field for the neighborhood. Further, the developer proposes to contribute half of the cost to install a traffic light at State Road 207. The second McGarvey business plan would include 160 homes to fit with the Residential B zoning that limits density to two homes per acre. The developer would complete the renovation of the golf course with partner, MacCurrach Golf, clean up and paint the exterior of the existing clubhouse/cart barn, add approximately 1,400 square feet of new space for offices/meeting room for First Tee and the general public, and would create two new parks to include a multi-purpose field and a playground. The Heritage plan would be to use 66 acres for residential development, building 192 single-family homes. There would also be a 4,000-linear-foot recreational path along with about 2.5 acres of park adjacent to the community’s conservation land. With a finalist selected, the plan will go to the County Commission, which could hear the item as soon as the Jan. 15 meeting. The agenda for that meeting has not yet been finalized. Billy Zeits, the interim director of parks and recreation for the county, and county communications director Michael Ryan met with Cypress Lakes residents Monday to update them on the status of the golf course changes. At that meeting, they didn’t even have the information about who had submitted RFPs. Now, there is a lot more information. Zeits said he was encouraged by what was presented by the two qualifying RFPs. 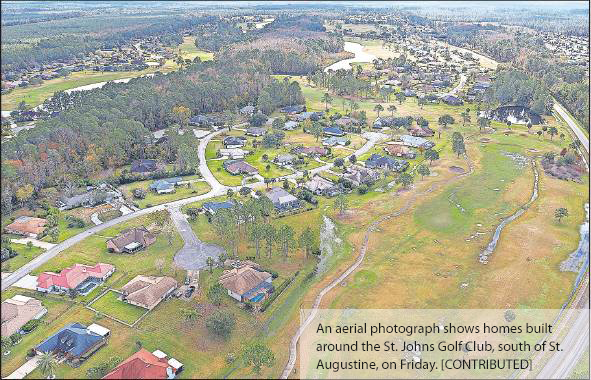 “Both understood the intent of the RFP, and the intent of the RFP was to look at what resources the county has, which is that excess land, and see if that could allow for the complete renovation of the St. Johns Golf (Club),” he said. From here, Zeits and the rest of the county staff must wait until they receive direction from the Commission. The Commission will evaluate the proposal and decide whether to authorize the staff to enter negations with the finalist. The commissioners could also ask for more information from the developer. Right now, neither party is bound to any action on the proposal, but the county can’t begin any kind of negotiations without the consent of the Commission first. Also, the Commission has no obligation to approve the McGarvey proposal. It can still decide to fund renovation, leave the course as it is or even to sell it to a private company. Ryan said in talking to residents, it was important to them that the golf course remain, regardless of ownership or management. “If there was one universal item that everybody agreed on (Monday) that was it,” he said. “There were a lot of opinions on how to do it and how to fund it and how to keep it alive. The majority of the people in the room that we spoke with understood the value of the golf course, understands how it contributes to the value of their homes and what it contributes to the community.